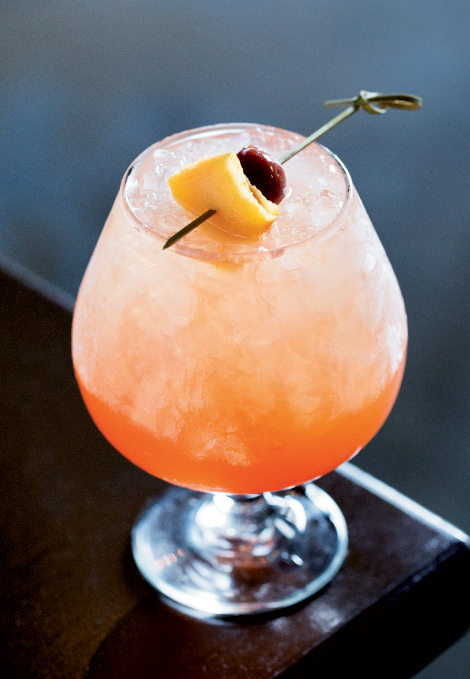 Even in the cocktail-centric circles of Asheville there is a throwback often absent from the menu: the classic punch. Seven Sows Bourbon & Larder remedies that omission with a trio of punches, including the powerful and pleasurable Tobacco Road. A pre-prohibition drink-of-choice, the original recipe of spirits, spices, citrus, sugar, and tea is making a sophisticated comeback with modern interpretations that add bitters, vermouth, and other spirits. “The resurgence of punches, and cocktails in general, goes hand in hand with the craft food movement in America, particularly here in Asheville,” explains co-owner Jason Caughman. The restaurant’s incarnation, which conjures up notions of velvet and spice, takes its name from the tobacco-producing belt of North Carolina, on which Asheville might be considered the buckle. For the hefty spirits element, Redemption Rye whiskey, aged for two years in new charred oak barrels and bottled at 92 proof, is combined with Old Weller Antique 107-proof bourbon. Don’s Mix, a blend of cinnamon, simple syrup, and fresh grapefruit and lemon juices, along with Peychaud’s bitters, Angostura bitters, and ginger syrup, provide the fruity and floral qualities. The Tobacco Road drains like a dream, with a zest of ginger and zing of citrus serving as perfect foils for the sweetness of the bourbon, whiskey, and simple syrup. Parting tip: If you’re pairing food with this drink, the raw oysters at Seven Sows are rollicking companions. cinnamon and a wide sliver of grapefruit peel.